We are living the age of the 3-pointer in college basketball. Teams are shooting more 3s than ever before, and the trend doesn’t look to be slowing down any time soon. But what can defenses do to combat it? Switching on defense is one tactic that’s becoming more and more popular; Villanova and Michigan, the final two teams standing last year, employed switch-heavy defenses most of the season. Here are six things to know about the defensive strategy that’s taking college hoops by storm. Isolation offense is the anti-pace-and-space. Most offenses these days want to penetrate, cause the defense to help, kick out to an open shooter and swing the ball around the perimeter. Switching negates that strategy, if done properly. The best tactic against a switch is to exploit a mismatch. For example, if a point guard and a center are involved in a ball-screen action, a switch would mean a point guard is guarding a center and a center is guarding a point guard. Those sound like tasty matchups. Sometimes, they are. But get a mobile big man who can hang with a smaller guy on a switch or a tough defensive point guard who can harass a center, and you can force opponents into bad, uncharacteristic shots. Check out this possession in a Villanova-Gonzaga game from last year as an example. The Wildcats had two of the most switchable defenders in the country in Mikal Bridges and Eric Paschall. 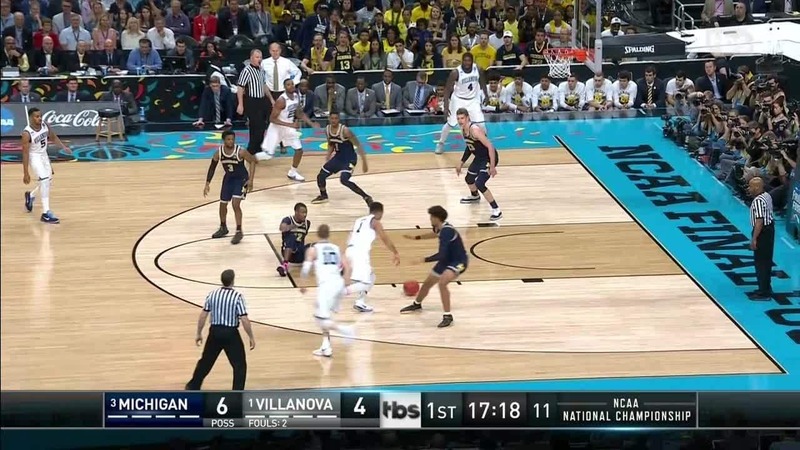 Villanova switches every action here, and it takes Gonzaga six passes to go essentially… well, nowhere. Josh Perkins is forced to take a heavily-contested shot because the Bulldogs can’t find a crease. Gonzaga doesn’t want to isolate. It understands the importance of ball movement and making the defense rotate. So the Bulldogs didn't take what the defense gave them. As a result, they wound up taking a bad shot. You saw an example of this above, too. Four Gonzaga regulars shot better than 37 percent from 3 last year, which equates to 1.11 points per possession. That’s really good. Any Bulldog possession ending in an open Josh Perkins, Killian Tillie, Silas Melson or Zach Norvell 3 is a positive. To be clear, switching is not a foolproof strategy. It takes a specific kind of personnel to be able to do it effectively. But it does coax opponents into more 2-pointers. If the switching defense is the counter to the 3-point explosion, there will be a counter to the counter. Setting more off-ball screens makes switching harder to execute. Every switch is a communication between two (or more) players. If one guy hesitates or screws up, the whole defense is toast. More weakside action creates more confusion for the defense, even if it’s all a decoy. Look for coaches to draw up more creative offensive sets this season. This is why wings are such a hot commodity right now. Get a guy who stands between 6-6 and 6-9, is athletic and has sound defensive technique, and he’s the perfect switchable defender. That player should be able to hang with guards, like-sized players and even some centers. Mobile big men who can move laterally are more valuable than ever right now, too. Mohamed Bamba was known as a rim-protector for Texas last year, and rightfully so. But he was also elusive on the perimeter for his size, and his crazy length helped him guard everyone. While Texas would rather have Bamba in the paint, he was rarely exploited by guards in ball screens. Some centers are liabilities guarding in space. It’s why speed is more important than ever, at all positions. The inverse: it’s why strength is crucial with guards. They’re much better defenders in this environment if they can battle with a power forward or center. Michigan is a team that’s figured a lot of this stuff out. At its core, the Wolverines are a pace-and-space, 3-point shooting dynamo. But they can play bully ball, too. That’s why Moritz Wagner was such a key player. Wagner scored 26 points on 14 shots in that game, mostly by taking smaller guys into the post on switches. There more switching becomes the norm on defense, the more post-ups will re-emerge. It’s not going to look the same as it did in the ‘80s and ‘90s. Gone are the days where you dump the ball to your best player on the block and hope he dominates against a like-sized defender. But exploiting a mismatch will always have value. Versatility is key, but anyone who thinks post-ups will soon be extinct should pay more attention to what defenses are trying to do to limit open 3-point attempts. It’s difficult for two main reasons. First, it takes a certain kind of player to be able to guard multiple positions. Undersized point guards may be great on offense, but they probably can’t hold up in this defensive system. Or you may have a plodding post-up beast who’s immobile on the perimeter. That guy can’t play in this defensive system, either. Second, it takes a high level of concentration. Players weren’t taught the art of switching growing up. While it can look easy, it’s usually a foreign concept, and the even slightest hesitation can cost your team. But if executed properly, it can be a huge asset in preventing the 3-point brigade. Look for coaches to use this strategy the next time you watch a college basketball game.